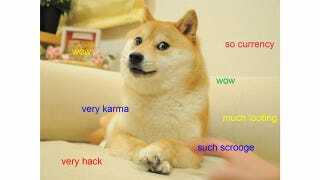 In what is either the exact definition or total opposite of a Christmas miracle (depending on whether or not you decided investing in a meme was a good idea), millions of the crypotcurrency Dogecoin were stolen in a hack on Christmas day. Many Grinch. Very irony. Wow. The meme-based digital coins were originally created as a joke counter-currency to Bitcoin but have since become at least mildly legitimate and, apparently, quite hackable. While each Dogecoin is only worth $0.00059 (compared to Bitcoin's $730 at the time of writing), the 30 million stolen have been estimated to add up to about $12,000, and investors over at the Dogecoin forums have been dismayed to find that investing in a currency created "without much real thought" has lost them actual money. Whoulda thunk. I used dogewallet to give doges to my parents as a christmas gift. I really cannot afford to replace them. We found many reports of Dogewallet transactions being sent to 'DQT9WcqmUyyccrxQvSrjcFCqRxt8eVBLx8'. We're currently looking at logs and have found thousands of attempts to hack our systems. Specifically, the attack originated from the hacker gaining access to our filesystem and modifying the send/receive page to send to a static address. We're currently reviewing logs for information. The site is shut down right now.